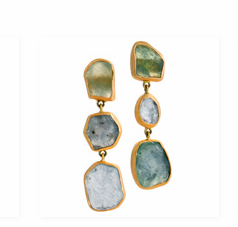 Diana Widman Big Sky Earrings created with sapphire crystals from Montana. As described by the designer "each stone is different but related shapes and color in a palate of slate, teal and sage. Simple, natural and feels good....just like Montana!! !